It's the holidays, and around this time of year I can't help but think about mistletoe. That's right, mistletoe. 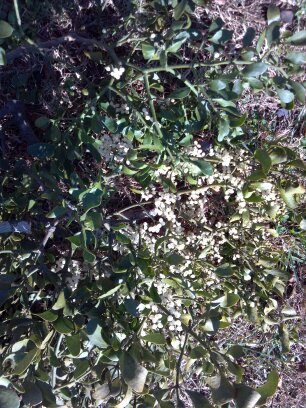 Mistletoe is the common name for over 20 genera of obligate hemi-parasitic plants of trees in the order Santalales. Mistletoe still photosynthesizes to create carbohydrates for energy, but it uses structures called haustorium to penetrate tree branches, where it then absorbs water and nutrients directly from the tree. With heavy infestations comes tree decline, and affliction with mistletoe can contribute to tree death. 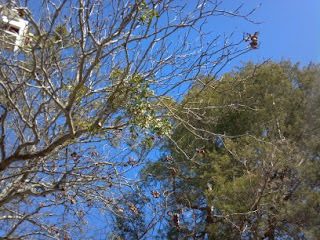 Branches with mistletoe can also become quite brittle. Hickory branches afflicted with mistletoe. The berries of mistletoe are a food source for many species of animals like birds, and is how the plant is distributed through out tree crowns. Birds either wipe the berries from their beak on to branches, or the seeds survive ingestion and are distributed through bird droppings (poop). The berry itself is extremely sticky when squished. 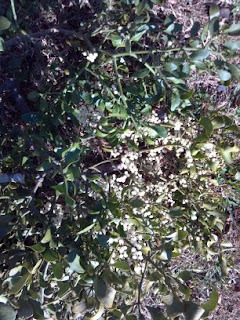 Most mistletoe flowers are insect pollinated, but some have huge showy flowers which are bird pollinated. Now if you thought all of that was interesting, the myth of mistletoe is something else. Apparently the Norse god Loki tricked the blind god Höðr into killing his brother Baldr with a mistletoe arrow. This was after Baldr and Höðr's mother, the goddess Frig, failed to get an oath from mistletoe to not harm Baldr. She never asked mistletoe take the oath as it seemed 'too young.' Lesson learned. After bringing Baldr back to life, Frigga declared no harm could come to one standing under mistletoe. Another myth states mistletoe was the wood that Christ's cross was made of, and after the crucifiction it was destined to live the rest of eternity as a parasite. Mistletoe is most famously sacred to the ancient Celtic Druids. After sacrifices, mistletoe would be passed out, and the recipients were thought to have good fortune. Mistletoe was thought to be the soul of the oak, and was collected at the summer and winter solstice. It was also thought of as a sexual symbol. Druid beliefs were adopted by early Christians and mistletoe was hung in homes to ward off demons. This is where the modern practice of decorating with mistletoe during the holidays came from. The Greeks had their own mistletoe tradition, and the plant was used during early marriage ceremonies as a sign of fertility. This, combined with the Scandinavian tradition of standing under mistletoe as symbol of truce with enemies, is probably were the modern Western European kissing tradition evolved from. So mistletoe is pretty interesting on many different levels. A word of warning though, if your mistletoe is allowed to touch the earth then it looses it's mystical powers. Happy Toe hunting, and happy holidays. 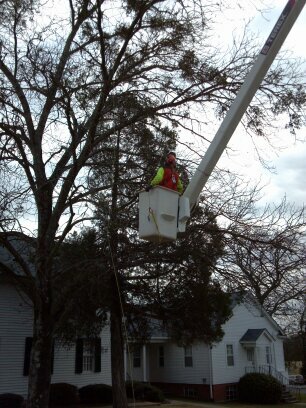 Toe harvesting is easiest done by aerial lift truck.